At 6-3, he is tall. At 185 lbs, he is strong. 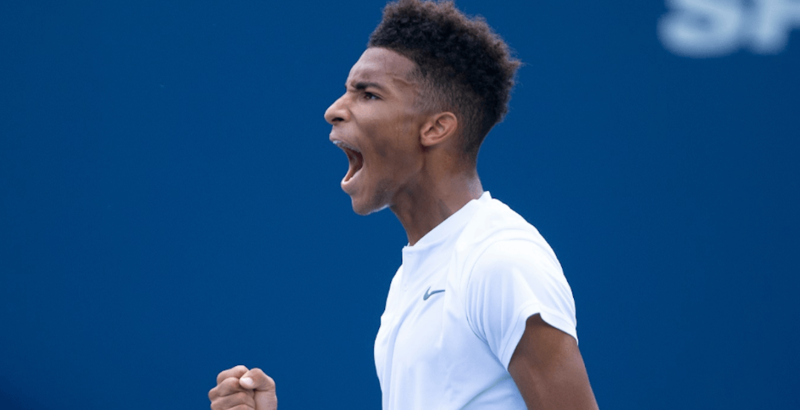 Felix Auger-Aliassime turns 18 on Wednesday, yet he already has the power to push opponents around the tennis court. On Tuesday, he showed he has the game too. Playing in his Rogers Cup debut, the young Canadian achieved his first win over a top-20 ranked player, beating world No. 18 Lucas Pouille from France. The 6-4, 6-3 victory is only his second win at a Masters 1000 tournament – that speaks more to his age than how good he is or how good he will be – with his first coming over fellow Canadian Vasek Pospisil at Indian Wells earlier this year. “I think it’s kind of a statement for me to win these matches, to prove to myself and others that I can compete with these guys,” said Auger-Aliassime following the match. Perhaps the most impressive part of the win was the almost complete lack of nerves he displayed. After breaking the Frenchman in his first service game of the match, Auger Aliassime fell to 0-40 on his own serve. Facing three break points, the Canadian fought back and held with a combination of huge first serves and gutsy, precise groundstrokes. On Auger-Aliassime’s very next service game, Pouille once again earned a break point. Showing poise and maturity, the Canadian fired a backhand up the line to avoid being broken and hold once again. “I started off the games bad, my service games, but I was able to hang in there and get those key games,” he explained. At 5-3, with the first set on his racket, the 17-year-old made his only truly costly error of the match. Auger Aliassime gave Pouille two looks at a break point and the Frenchman capitalized on the second to get back on serve. What followed was probably the most impressive game from Auger Aliassime. On Pouille’s serve, Auger Aliassime pushed the score to 15-40, and he needed only one look at break point to capitalize and take the set. The second set followed a similar script, with young Felix grabbing an early break. This time he wouldn’t look back, holding his remaining games and taking it 6-3. Earlier in the day, Djokovic was asked about the doubles match he and Kevin Anderson played against Denis Shapovalov and Auger Aliassime on Monday. “You know, [Felix] is not even 18 and he’s playing at this stage and showing dedication on the court and willpower,” said Djokovic. In June, the Montreal native won his third challenger title in Lyon. With the win, he joined Novak Djokovic, Juan Martin Del Potro, and Richard Gasquet as one of only four players to have won three or more challenger titles before his 18th birthday. Following the match, Auger-Aliassime spoke about how well he played in his on-court interview.